Now I really wasn’t sure what I could say that wasn’t expressed by so many others before me. A lot of the performers I’ve featured on The Blues Blogger for the past 3 years credit Stevie Ray Vaughan as a huge influence. One thing’s for sure, even though its been 20 years since his death, his musical spirit continues to inspire and shine through the hearts and souls of so many great musicians; new and veterans alike. As I typically do in the month of October I like to change things up a bit by offering a few giveaways to celebrate my site`s anniversary. So instead of writing some biographical information that most SRV fans are already familiar with, I’ve decided to giveaway away one copy of a recently re-released book about Stevie Ray Vaughan by Craig Hopkins called Day by Day, Night After Night. In the book you`ll find interviews, photos and in depth information that will impress even the most avid fan. This giveaway is now closed… Congratulations to Cliff Kapitsky. You will need to CLICK ON THIS LINK HERE, or on the book cover to the right. It will take you to a contact form where you must fill in your name and e-mail address. You can enter any additional information in the message box if you wish. But if you prefer you can also put your thoughts on the comments section below. This will further enhance the post by allowing you to share your memories of Stevie`s music with everyone who reads this. And if you do add your comments, I will put an extra entry in the random draw for a total of two entries for the book. The giveaway will close Sunday October 31st 11:00 pm eastern time in the United States. One winner will randomly be picked from all entries and they will have 24 hours to respond. Otherwise, a new name will be drawn. Day by Day, Night After Night was originally released in 2008 as one volume with only 3200 copies printed. The book is now being re-released by Backbeat Books (Hal Leonard Corporation) as a two volume set. Author Craig Hopkins was the 2009 winner of the Keeping the Blues Alive (KBA) Award for literature. 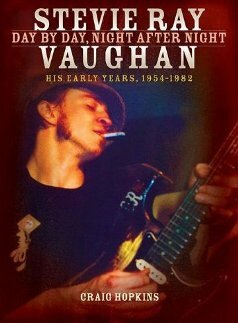 The first volume in his new edition covers Stevie Ray Vaughan’s early years from 1954 -1982. It tells the story of Stevie’s life and career through a series of interviews with over a hundred family members, friends, band members, girlfriends, manager’s agents, and roadies. The book is filled with quotes and molded together to shape a story that is explained with thousands of additional facts and illustrations. The second volume which covers 1983 – to the present will be released in the Fall of 2011. How about you? What songs or time come to mind when you think about the music of Stevie Ray Vaughan? Share your thoughts by commenting below. I’d love to see this post grow. So let’s hear from you!!! And good luck to all who enter the draw. Just yesterday (literally) I was talking with someone who worked for an Austin, TX radio station “back in the day.” She and her husband both dearly loved Stevie Ray Vaughan. Unfortunately, I never got to hear him play as they did. I only grew to love his excellent electric blues music and singing after the helicopter crash that took his life. Although I have magazines and paperback books, I do not have Craig Hopkins book, a labor of love with unique insight into the life of SRV. Hopefully, I can win it! Thanks at least for the opportunity. When I want to just sit back alone and listen to joyful music, I choose SRV. Just serves to make me happy and relaxed. I can not help to wonder where his music would be today had he not met his untimely death. Still, such a legacy. Tin Pan Alley, Crossfire, Cold Shot, Texas Flood, Riviera Paradise, Life By The Drop, The Sky Is Crying, Look At Little Sister and every other song he did; these are just my “deserted island” songs. SRV got me interested in the Blues and life again, saving me from my own worst self. I never got the chance to see him live, but he lives on in my mind and my ears. Long Live Stevie! Lenny: Still makes the hairs on the back of my neck stand up. I saw srv in college by myself . . . he was still pretty new and played with his brother’s all star band as warm up. it was stevie, a drummer and a bassist and all stevie did was jam up against the backdrop of marshalls with one lone spotlight on him. I also own a dvd that’s pretty early from a blues joint in canada. As I struggle to learn to play the guitar, I know that I’ll never achieve the skills of SRV, but I try. He is a master. I have admired Stevie’s work and shortened career. I’m an oldie, 55, but I believe that his style has influenced the great majority of blues players the world around. SRV gets the credit for getting me interested in the blues. I’m sure that’s true for many people my age (42), but his crossover onto pop/rock stations opened a door to a whole new world. I was fortunate enough to see Stevie in Richmond VA at the acoustically wonderful Mosque (now Landmark Theatre). I was completely mesmerized and amazed by the performance. It was the fall of 1989 and I skipped a frat pledging event for it and when I was grilled as to why I wasn’t there and why they shouldn’t toss me out; I simply said Stevie Ray Vaughan and I couldn’t have missed it for the world… That was all I needed to say as I was totally forgiven and questioned to no end on the show… It was an awesome event. I saw Stevie at the Commodor Ballroom in Vancouver B.C. I remember being amazed at the amount of sweat he produced. But even more amazing was the fact evry song he played was simply fantastic. If I have to pick only one song to call my favorit, I would have to say that right now it is “Life by the drop”. …. wow, it’s been 20 years already… I saw him in Denver the same year he died I think… his “warm up band” was Joe Cocker… which kind of meant that that night we had two “main attraction bands !! Joe came out then stayed late until he was told he had to get off the stage !! SRV came out, no talking just went down his first four albums or so then he left…. no encore at all for SRV… that was sad !! Then about 3 months later I heard he died in Clapton’s helicopter, no Clapton just Stevie and the pilot !! I was told he caught a ride at the last minute…. not knowing he was flying off into “Blues Music History” that night !! Thanks Blues Blogger for this fantastic showcase and article !! i din,t know this fellow till recently going through the discovering of blues musicians…then i realized how good he was and had heard his music many times but..din,t know about his death was like 20 years ago…a master in his art of guitar playing..i,m stunned by the quality of his music…i shall be listening to more of his music for sure..thanks for this awesome post..
20yrs! Man, he was just getting clean and I think he was playing better than ever at that point…so sad, but he left us so much better off with his music..Here’s to you Steve Ray Vaughan, you saved the blues, and made me smile! My favorite song that Stevie Ray did was Jimi Hendrix’s version of Little Wing! Gives me goose bumps when i listen to is still…. srv was great and when he went, I recorded the first ever tributes to him…they were played by my local disk jockey 1 week after his demise…..miss him. I was born a blues /jazz person (my brother is a blues guitarist, so its ingrained in me), and I had heard of Stevie 22 years ago, but the jazz station I listened to that played blues, didn’t play his music (heard about him from them the day he died though)… so I only discovered his music, and saw HIM, when someone posted a youtube video of him doing Pride and Joy… it was like getting smacked in the face… I remember thinking to myself “THAT’S STEVIE RAY VAUGHAN?? ?” I was and still am amazed… how the hell did he get by me for so long?? ?”… but Stevie is really the top dawg, even 20 years after his untimely death. I wake up with his music in my head some mornings, and am certainly singing his songs to myself over the day…. Life Without You, so prophetic and a truly beautiful piece, and Riviera Paradise-the performance at Austin City Limits- is in perfect sync…. Stang’s Swang, another great and early jazzy piece. He loved jazz and it showed. Hug You Kiss You, Pride and Joy, Cold Shot, Little Wing… Scratch My Back, Give Me Back My Wig- I love the older pieces he did- Hounddog Taylor, Otis Rush, Elmore James, ect. He loved blues… and Texas blues, sooo good! Life WITH him… not without. When will they make a movie about Stevie? Has anyone tried? I was fortunate enough to have seen Stevie live 8 times up here in Montreal.His music for me was about the only thing going in the 80’s.His music is powerful,soulful always able to reach deep inside and stir things up.I took a trip down to Texas back in ’93 to visit his statue and the family plot,just to say thanks. Fingers crossed. I’ve been wanting to read this! Thank you for the entrance of SRV Book Giveaway Entry. Think of All the Musicians that he inspired still to this day. To take the blues and make it mainstream. Making history every time he played. That blues tone we all try to copy.